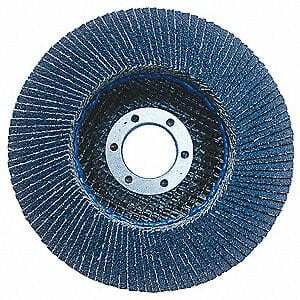 40 grit, type 29 4-1/2″ flap disc with 7/8″ hole to fit in most standard angle grinders. Excellent for removing rust and scale. Flap discs are a versatile grinding and finishing tool consisting of three main components: a fiberglass depressed center backing, adhesive, and rectangular pieces of abrasive cloth. The abrasive cloth is cut into rectangles, overlapped and glued to the fiberglass back, which provides longer life and a softer application. Flap discs offer numerous advantages over depressed center wheels including: less noise, no loading, higher rate of material removal, no chattering or vibration and less operator fatigue. They are available in two styles: Type 27 which has a flat surface, and Type 29 (conical) with the flaps placed at an angle. Flap discs provide higher productivity and cost savings than depressed center wheels, and disc changes can be eliminated when you use one disc to go from grinding to blending to finishing.